Your personal data on the machine? The computer not being in working condition? The legality of the software on the machine? If so bring the computer into Advanced Solutions In Technology, LLC to have all data securely erased, have the computer physically cleaned up and restored with legal software including free anti-virus and open source Office Productivity software. We will also load a free open source Operating System onto the computer if there is not a Legal COA for Windows available, or if the COA is unreadable. If the computer is not fixable, it will be recycled. 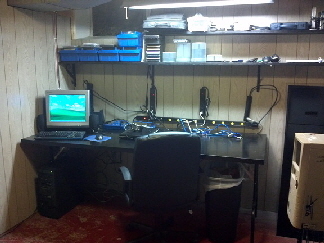 Computers do not have to be complete, a tower can be donated without a monitor, keyboard, or mouse. Why do we offer this service? Because we want to make sure that there are as few technology products as possible being improperly disposed of. We want to be sure that our children, and their children, and their children after them can enjoy the beauty of nature that we take for granted. We also realize that there are people out there that can benefit from having a working computer for school, but can not afford one. Donating computers will help these people by offering them a low cost alternative for purchasing a computer. This free service by Advanced Solutions In Technology, LLC helps by easing the donating person(s)’ mind about the above issues while also ensuring that the Donation Center has a working computer to sell that has been freshly reloaded with legal software and no personal data. Computers must be dropped off at Advanced Solutions In Technology, LLC. Paid work takes priority over Donation work. Donated computers that have had the free donation services completed may be held until there are more computers to be donated completed. There may be a delay before a receipt is received from the donation or recycling center for the donated computer. Delays may vary. All data on the computer will be erased. If any data is wanted, it should be backed up prior to being brought in. Advanced Solutions In Technology, LLC can back up data from a machine to be donated at the rate listed on the Services Page. Paid data backup will not ensure that a donated computer will be donated faster. Paid data backup will be completed along the paid work queue, and then the donation services on that computer will be put into the donation queue. After donation services are complete, computers must be delivered to the donation or recycling center by the staff of Advanced Solutions In Technology, LLC. A receipt for the donation or recycling will then be mailed to the person(s) who donated the computer. The fair market value of the donated items must be filled out by the person(s) who owned the items that were donated, the staff of Advanced Solutions In Technology, LLC can not fill out values on a donation receipt. The computer will not under any circumstances be returned to the person(s) who donated the computer after the free donation service has been started on the computer. Some components of donated computers that can not be made usable and that are going to be recycled may be taken out to be used on other donated computers. UNDER NO CIRCUMSTANCES WILL ADVANCED SOLUTIONS IN TECHNOLOGY, LLC SELL A DONATED COMPUTER, OR PARTS OF A DONATED COMPUTER. Advanced Solutions In Technology, LLC, the donation center(s), or any of their affiliates can not be held liable for any data lost, destroyed, or left after free donation services are performed. You must agree to the above and sign and date a document attesting to such when dropping off equipment to be donated.